DFC Cater provides a food catering to all types of event, such as Wedding, Birthday Party, Annual Dinner, Engagement, Corporate Event, Family days, Seminars, Conference & Exhibitions and other occasions. We have the different type of service which is Buffet Service, Dome Service, and Pre Packed Meal. Foods are arranged on buffet tables. Guests usually move along the buffet line and serve themselves. When their plates are filled, guests take them to a dining table to eat. 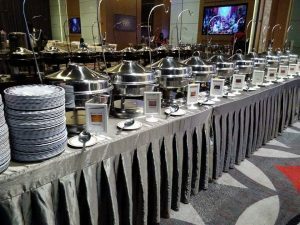 The buffet is most popular in Malaysia and suitable all type of Events. Foods are pre-set in dome limited 6 dishes and the dome its place in the middle of the dining table. Guests will help themselves from the dome and waiters will serve separately on desert and drinks. No refill meal in Dome except drinks. Usually, Dome Service requires more waiters and each waiter will serve one or three dome table depending on customer requested. Dome service suitable for Wedding Reception and Corporate Events. 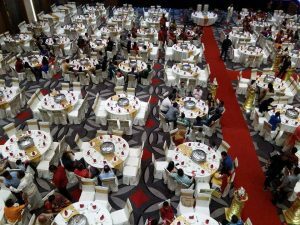 We provide our catering service in Selangor, Kuala Lumpur and certain place at nearby state as well (Negeri Sembilan, Melaka, Pahang, and Perak).